No short cuts here which makes this recipe for a parmesan breaded chicken cordon bleu a weekend project. The beauty is that it can be made a day or two ahead before just popping it into the oven to bake. So choose to try it. Just add a bottle of wine, your favorite music and invite your signifcant other or a friend to join you for a fun time in the kitchen. 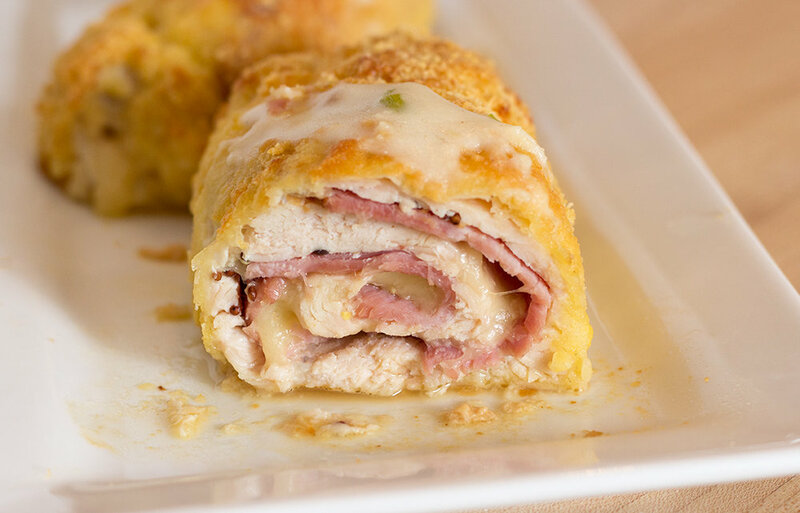 The chicken is thinly flatten, layered with ham and cheese, rolled in a parmesan cheese breading and then baked. Chicken is tender and you can really taste the cheeses. I've added a white wine sauce that also carries a creamy, cheesy flavor. I believe I have covered the gamut of chicken cordon bleu horror from making my own to purchasing it ready to bake to even eating it in a restaurant. More often these were the results: chicken overcooked. chicken dry. chicken cut too thick. not enough cheese. cheese ran out into the baking dish. couldn't fine the ham. And on and on it went until I simply avoided chicken cordon bleu anywhere. The recipe here is the results of giving it one more try, than a second try, a third try and finally a fourth try where the majic kicked in. But it happened with great, invaluable tips from 911 Chef Eric Arrouzé, a French chef. I decided no more short cuts or pretend chicken cordon bleu but simply make it as intended--with one big exception and that's the substitution of a cheese breading. I found that while the freshness of the ingredients was very important, so was the technique for preparation. I try to illustrate those techniques in the slide show below. Slicing the chicken breast in half going lengh wise; sprinkling it with cold water before pounding it; and folding the edges inward were key. I only flatten the chicken breast to 1/4" because, for me, less than that and I shredded the chicken. Place chicen breast on top of a cling wrap. Starting at the thick end of the breast, slice it length-wise. Sprinkle several drops of cold water on top of breast and cover with cling wrap. Use a rolling pin or the smooth part of a mallet and gently pound the breast to about 1/4" thick. Run fingers across the flatened breast for uneven spots, pound these spots out. Spinkle cold water on breast. Lightly brush dijon mustard or whole dijon mustard across the breast. Lay a thinly sliced black forest or rosemary ham on breast. Then add a thinly sliced cheese, swiss or provolone. Gently lift cling wrap to fold 3 edges of the chicken breast over the ham. On the 4 edge, lift wrap to fold over the edge and then tightly roll the stuffed breast. Secure the 2 ends of the roll by twisting the cling wrap. These are your breading dishes: flour, washed egg and parmesan. Roll the stuffed breast in the flour. Shake off excess flour. Next, roll the breast in the egg wash. Finally roll the breast in the parmesan. Place chicken breasts on a baking dish or plate and refrigerate for one hour. Also see the slide show above. 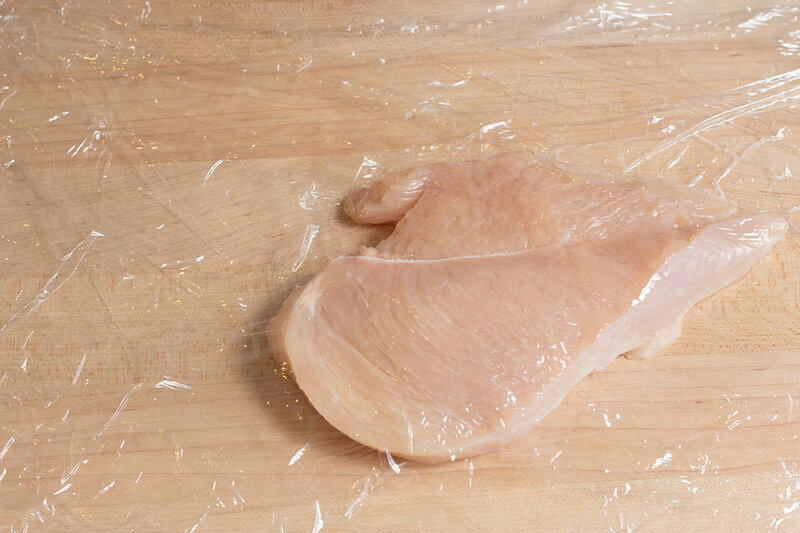 Place the chicken breast on top of a sheet of cling wrap on a chopping board. Starting at the thick end of the breast, slice length wise into two halves. On the first half, sprinkle it with cold water. This will help the chicken fibers to spread. Place a second sheet of cling wrap over the breast half. Gently and evenly pound the chicken breast to about 1/4 inch thick. Be careful to not pound the edges into shreds. Remove the top cling wrap. Brush a thin layer of Dijon mustard on the breast. Layer one slice of ham on top, then a slice of cheese on top of the ham. Try to leave about 3/4" of the chicken breast edges uncovered. 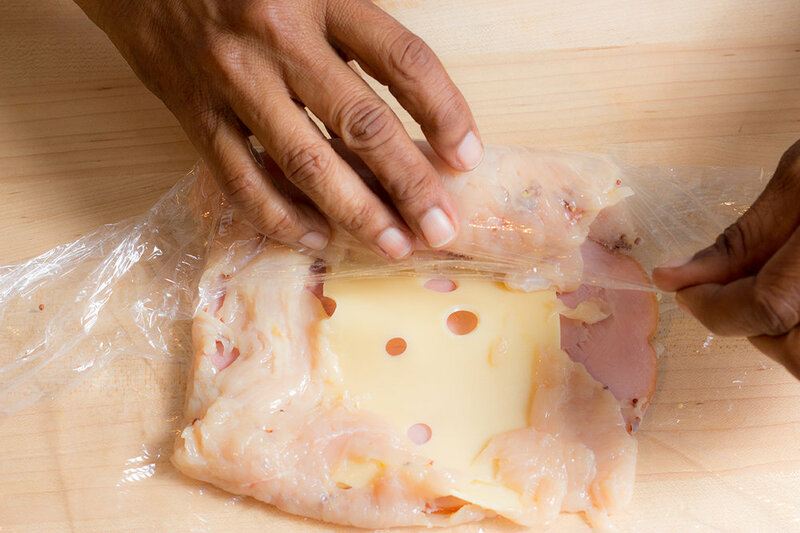 On two opposite edges of the chicken breast, lift the cling wrap and fold the chicken edge over onto the cheese and ham. On one end of the chicken breast, lift the cling wrap fold over the edge of the chicken. 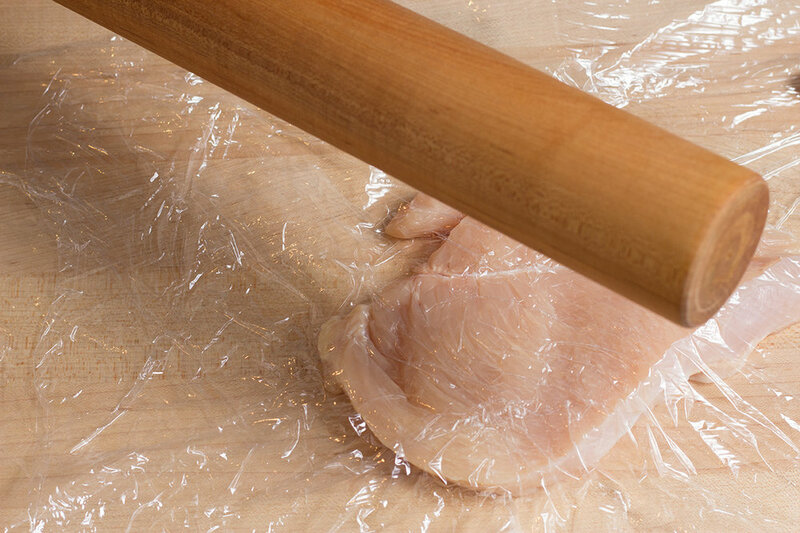 Use the cling wrap to form roll the breast meat as tight as possible. Twist the ends of the cling wrap. Repeat steps 1-3 and place in the refrigerator for 30 minutes. While the breast rolls chill, set up the breading dishes for dredging. Place flour in one dish, the egg wash in a second dish and the finely grated parmesan cheese in a third dish. Add salt and pepper to the egg dish and the parmesan cheese. Remove chicken rolls from the refrigerator and remove the cling wrap. Dredge one chicken roll in the flour and gently shake off excess flour. Then dredge it in the egg wash, and finally dredge it in the parmesan cheese. Use a fork to help completely cover the chicken roll at each step. Repeat the dredging steps for the second roll. Place breaded rolls on a baking sheet and refrigerate for one hour. Preheat oven at 375 degrees F. When ready, remove chicken rolls from the refrigerator and pop them into the oven. Bake 35-40 minutes. If you are using a conventional or an oven that cooks unevenly, turn the baking sheet around midway during baking. Remove from the oven when brown. You may need to finish the browning under the oven grill for a little less than 1 minute. Just watch closely that it doesn't burn--and don't overcook! On a medium heat, prepare a roux by melting butter in a sauce pan. Add flour and stir to mix well. Add salt, white pepper and the parmesan cheese. Continue stirring while adding cooking wine, dry white wine and the heavy cream. Snip in fresh chives to taste. Serve the dish by pouring the cheesy wine sauce over or just on the side of the golden baked parmesan breaded chicken cordon bleu.